When my family goes out to eat at a Chinese restaurant one of their favorite soups is won ton soup. In case you were wondering, the other is sizzling rice soup. Won ton soup is something I fiddled around with figuring out how to make at home. I made it several times during the same week as I tweaked the recipe. To say that my family was not interested in won tons after that week would be an understatement. However, it is a dish they love when I remember to put it into our dinner rotation. In a mixing bowl mix the sausage, water chestnuts, ginger, sesame oil, scallions and several dashes of soy sauce until well incorporated. Using a teaspoon place a pile of the sausage mixture in to the middle of the won ton. Wet 2 edges of the won ton with water and fold to make a triangle. Make sure to press from the center to the outside edges to seal the won ton, there is nothing worse than an exploding won ton in your soup. 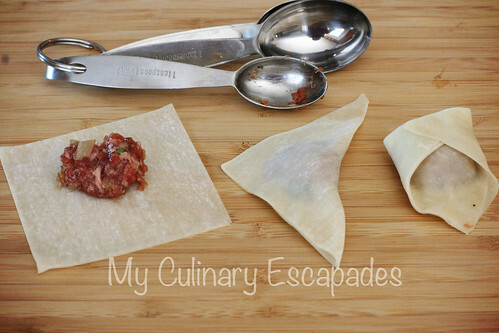 Air pockets can loose the filling and make the won ton not cook evenly. After folding into a triangle bring the long points up and attach using a bit of water. 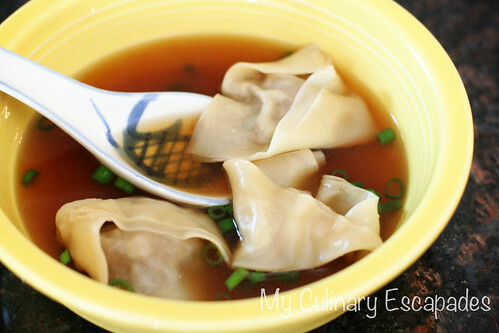 Place your created won tons on a sheet pan until you are ready for your soup. You can make them in advance just make sure to not stack them on the sheet pan and cover with plastic wrap so they don’t dry out. In a medium saucepan heat up your chicken broth. Add 1-2 tsp of soy sauce depending on your preference. If you like carrots or mushrooms in your soup now would be the right time to add them. If you don’t want your broth to become unclear make sure you steam them separately and add them in the end. My family likes it with just broth and dumplings so that is how I make it. Once the broth is at a slow boil add your won tons. I like to serve 2-3 per person. After putting the soup into the bowls I like to finish each with a handful of scallion greens. It adds a nice flavor to the broth and a great texture when you are eating the soup.